Imagine a stream full of fish and amphibians, the stream winding through an ecosystem, meandering naturally. The winding action creating habitat as it sreams downward, cleansing water and bringing a wide range of ambiance through edge diversity while being full of logs and big stones. The tangled messes in front of us looks chaotic, yet this diversity is the fulcrum of order actually. Unfortunately this pattern of wild habitat has not been how land managers have been viewing how they should manage their water resources for quite some time now. Instead the straightening, channeling and “cleaning” of streams has had a detrimental affect on local ecosystems and the hydrological cycle. For far too long our perspective on water has been to shed it rather than harvest it and then pipe in water at a great expense of energy including finances. Instead we should look and seek inspiration from our zone five areas that are filled with “junk” and seem rather unkempt. One sign of healthy streams is to find sequences of run, riffle and pools within the water channel. This pattern is aided by large woody debris and big boulders which help to create the cascading and meandering effect that brings this sort of healthy habitat. With this pulsating pattern, pools are formed as the water pours over the obstruction and the scouring effect from it creates the diversity of habitat. Scouring erodes the bedrock over time and induces meandering as water always finds a clever way to reach a downhill location. Without it the stream tends to flow with flashiness (big doses of water) and exponentially degrades overtime. Also they do not deposit their sands on the inside stretches of the stream helping to further shape the pools and keep the stream free of this material. Salmon/ trout streams greatly depend on this expelling of sediment as the fish eggs are suffocated from this material deposition in the middle of the stream rather than on the inside of banks that is facilitated from the natural sinuous shape. In the picture above with the blue background, it depicts a protected stream in the redwood forest in Northern California, USA. 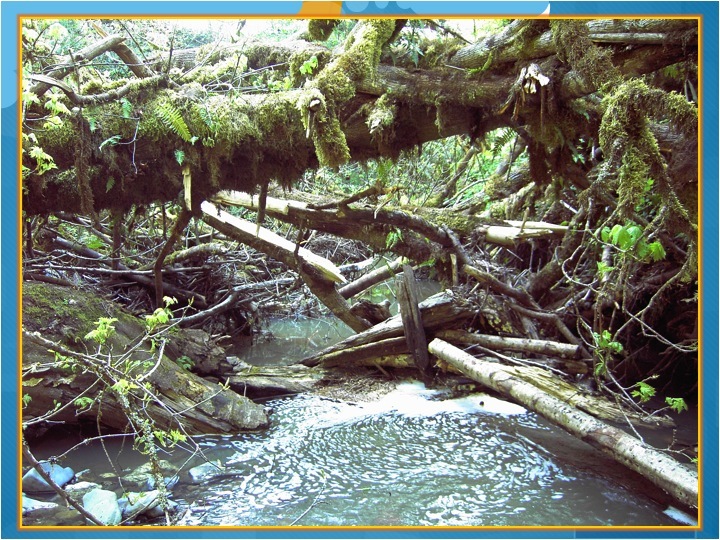 The image shows the trapping of nutrient load, “natures froth”, from the pooling action aided by the large woody debris. Without this net and sieve for energy, edge, the water and subsequent energy would be draining causing a spiral of erosion. This is why channeling and cleaning streams is so detrimental. While it makes sense on a rational sense, the checks and balances are ruined and the flood and drought symptom flares up much more often as well as declining fish habitats and populations. Breaking the fabric of life in waterways can only result continual degradation and has far-reaching social and economic impacts as this is the result of waterway sickness (flood and drought). This is why adding large woody debris through intentional felling or adding directly is so important. This edge is vital to systems so fish and other creatures can return and proliferate. I visited this stream as part of my class on fisheries and it was a very healthy stream in terms of the young Salmon fry that inhabit it before their migration out to sea. This is because the pool habitat creates safe havens when the stream is running at full force from heavy rains. Nature is a great designer and having trees grow alongside it and with time, trees fall in. Streams even erode banks to help this downward motions so they co-create together. As old growth trees were removed from riparian edges, the raw natural resource for stream management was erased. In essence the bank account of nature was on constant withdraw. Too many times to the ATM for too many dinner and movie nights and shopping mall extravaganzas. The problem was only compounded through systematic destruction of waterways before oil based machinery really altered industrial harvesting of trees. 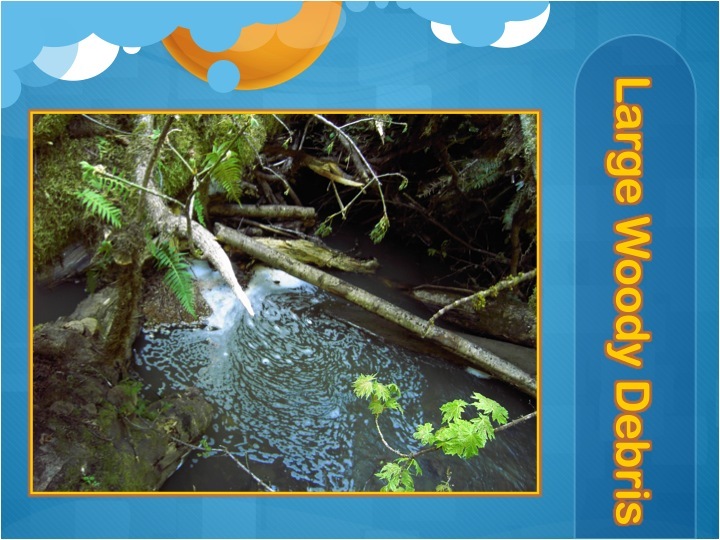 At one time, streams were dammed and trees were felled and moved into the pools behind the dams. To get the logs downhill to city centers for processing the raw material, sticks of dynamite were placed in the dam wall causing a huge rush of water and the logs to come screaming downhill. This was only about 20-30 % effective and had a huge detrimental effect to the habitat of streams and rivers obviously. Large woody debris and boulders were dislodged and displaced removing the co-creative energy of nature to cleanse the water and provide habitat. This was analogous to a massive disturbance that would only happen in immature ecosystems (early successional) or on such a time scale that natural displacement of humans would have occurred from say a landslide. However human society ignorantly did just this for quite some time as the industrial revolution ramped up and sputtered along in the name of progress. However by knowing what was there before, and what broke the pattern, we can creatively interact with nature to replace the big boulders and large woody debris that once was and brought so much abundance. A line of rocks can be piled over time upwards as to create a gabion like effect to improve stream hydrology. However with one rock dams this is done gently over time only going up one rock high at a time rather than building several high in a classical gabion. They are built several rocks deep but again only one high. Over time the rocks trap sediment and rebuild the stream channel upwardly. Overtime as water is slowed and sediment and organic material is trapped, wetland plants re-seed themselves and establish a further edge and filter. Over time the rock dams can be increased by one rock again vertically so that the stream incising is decreased. Incising drops the overall water table of a site decreasing the resilience of the system during the dry months as it decreases energy cycling. This technique of one rock dams brings the stream channel up and subsequently spreads water laterally through the system. This works through the capillary effect and nourishes the overall landscape. Thus trees and other perennial vegetation is supported which brings further stabilization of the hydrology of the site through increased infiltration of rainwater from the energy transaction that occurs from this vegetation. couple of different fashions. The technique shown in the picture below is a series of dry stacked rocks in the stream channel to slow waters descent down these incredibly flashy streams. Drylands receive huge deludes sometimes and this causes much disturbance in the stream and surrounding land through the flood waters and mud flows. By placing this edge in, sediment is trapped allowing vegetation to eventually spring up and raise the spreading of water horizontally through an elevated stream channel. While they might not slow a huge runoff event in their first year, the gabion does overtime give more resilience to the aquatic ecology. Gabions are also used in more humid locations where erosion gullies occur and are degrading the stream system. They put an edge in and create a lip for the cascading water to fall onto and begin to establish once more the natural meander and run, riffle, pool sequence. In addition to some of the techniques above, Bill Zeedyk and others from the Quivira Coalition and beyond are advocating numerous strategies and techniques for stream channel restoration. I include it in this section as it is a great work that is being done especially in drylands and ranching areas. Ranchers also want healthy fish populations on their properties for the most part and the education that the coalition is doing is incredible. Its remarkability comes from integration and getting environmentalist and ranchers to work together rather the normal tendency of them fighting against each other. The cascading effects of the stream restoration is far-reaching including healthier pastures which of course cascades into animal health. Finally, many integrated systems are needed to restore hydrology and the full hydrological cycle. In other words, there is no one answer, try the principle of for the important function of completing the hydrological cycle, use multiple elements to support.